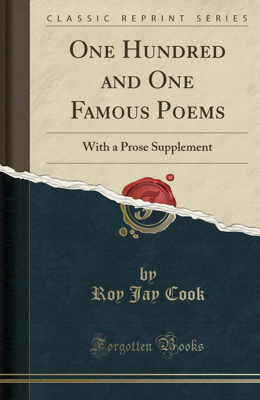 For a poetry novice like me, One Hundred And One Famous Poems, With A Prose Supplement, was the perfect read. A concise anthology from the best of the best. These famous poems, stretching from the 16th to 20th centuries (most it seems from the 19th), include the familiar (e.g. "The Night Before Christmas," "The Spider and the Fly," "The Charge of the Light Brigade"," Invictus," "Trees," "Elegy Written in a Country Church Yard," and "Paul Revere's Ride") and those with which I probably should be familiar (e.g. "Opportunity" by Sill, "Be Strong" by Babcock, "That Time of Year" by Shakespeare, and "The Children's Hour" by Longfellow). The Prose Supplement included Lincoln's Gettysburg Address, The 10 Commandments, the Magna Charta, The War Inevitable, and The Declaration of Independence. The book was a delight and I shall return to it again. Reading poetry has a way of slowing down one's pace. It will not be hurriedly pushed. Its fruit cannot harvested its fruit in an instant; the juice must be sucked out. 1. The poem, "Opportunity" by Edward R. Sill. Of course one does not need to purchase the book to read the poem, but if you find one that connects with you the way that one did with me, you have come away a wiser person. 2. Attaching familiar names (e.g Browning, Dickinson, Eliot, Frost, Keats, Longfellow, Shakespeare, Shelley) to their classic works. 3. Having an indexed list of classic poems at your fingertips. 4. Sitting with the masters of their craft, learning to see life in a different light, moving more slowly and absorbing more fully. I wish there were a brief background on the authors. An explanation/annotation would also help, but to my point -- in most cases that is more a matter of me slowing down, considering the context and figuring it out.